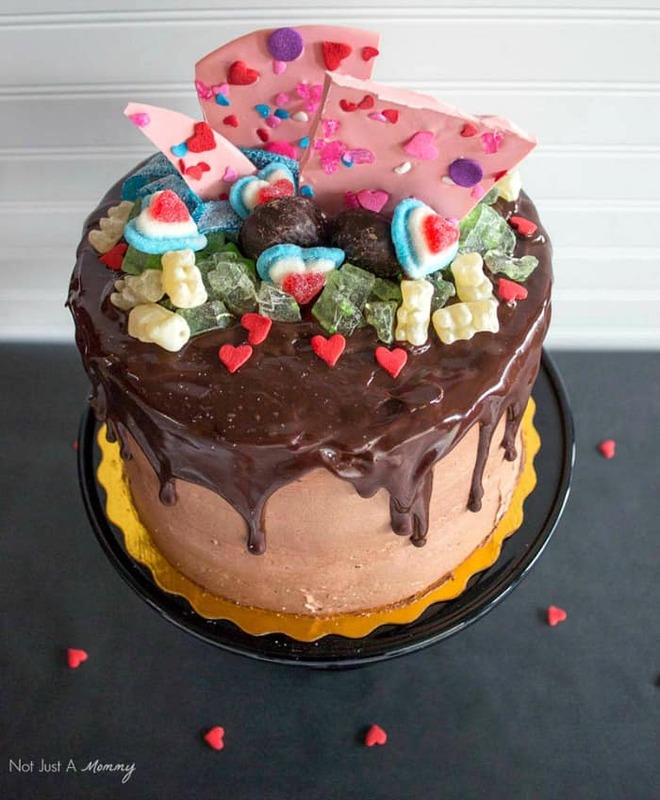 This Valentine Drip Cake post is courtesy of our contributor Dawn of Not Just A Mommy…Last year, it was naked cakes. 2016 is the year of the drip cake, thanks to the amazing colorful and fabulous creations by self-taught Australian baker Katherine Sabbath. Just type in ‘drip cakes’ on Pinterest and you will be in a world of amazing cakes inspired by her work. If you have cake-making skills, you will need to make a 3 layer cake, frosted smoothly with buttercream, and well-chilled (overnight is perfect). If you are like me and don’t have cake-making skills, head to your favorite bakery and order one. The chocolate ganache is key…if you have your own firm-setting recipe, awesome! I used this recipe from Martha Stewart and let it cool for 10 minutes so it could thicken. 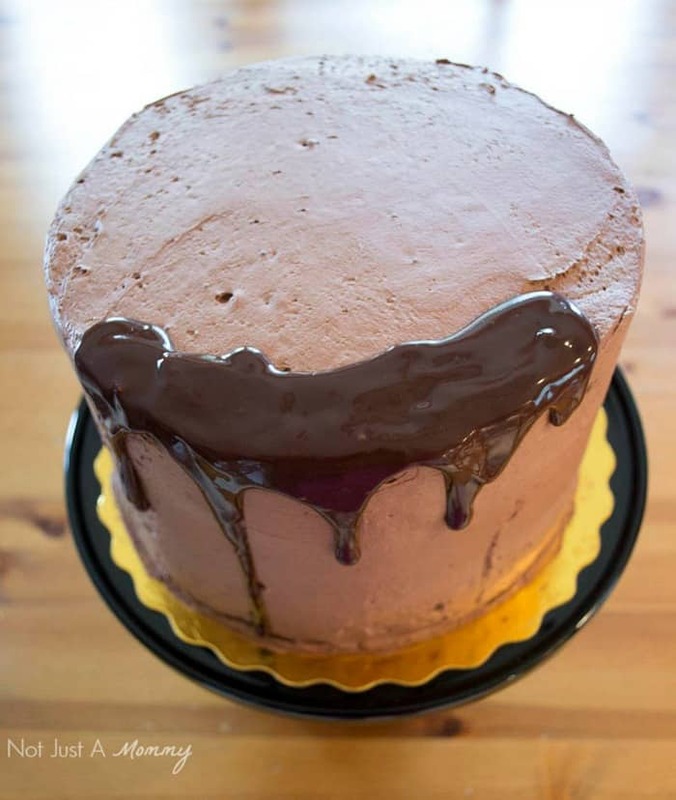 The trick isn’t to pour on the ganache, but using a spoon to add a few careful drips over the top edge of the cake. How much is up to you…the bigger the spoonful, the longer your drip. I poured a spoonful near the edge and careful pushed it over. It took a few to get a better feel for the ganache and you have to work quickly because the cooler the ganache gets, the thicker the drips will be and less likely to run all the way to the bottom of the cake. Once your drips are done, pour ganache on the top of the cake and use an offset spatula to push it to the cake edge and smooth the top. Again, you have to move swiftly or your ganache will set and you won’t have a smooth top; every time you touch it, will leave a ripple. This is totally ok, so don’t freak out like I did, because you are covering it with sweets anyway. Next time, I will have a better feel for it and get that nice smooth top you see in so many photos…but I’m not a professional, so I need to let that go. Now, the fun part – the toppers! You can use any sweets you want, from chocolates to cookies, candies and sprinkles in your color palette. Vary your textures and colors for maximum impact. 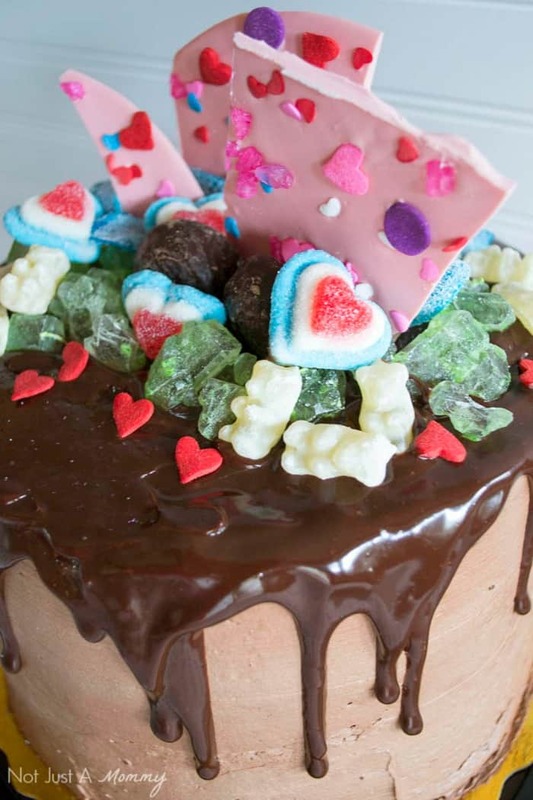 I used everything from gummi and sprinkle hearts to chocolate covered marshmallows and rock candy. 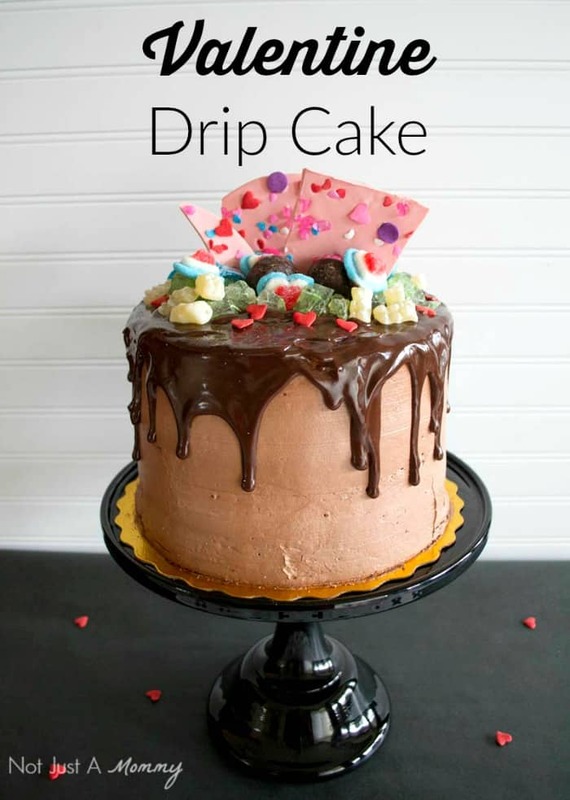 One of the signature features of the drip cake is a tall element. 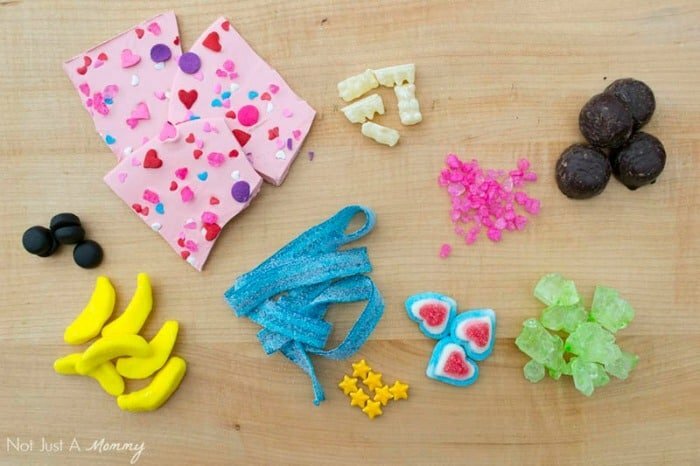 I like using candy shards, which is really candy bark; check out my Minions party for the easy tutorial to making your own candy shards. You can make candy shards with hard candy as well. Place your tall elements first and fill in your design with the rest of your sweets. Start with larger pieces and finish with the smaller pieces adding as much as you like! 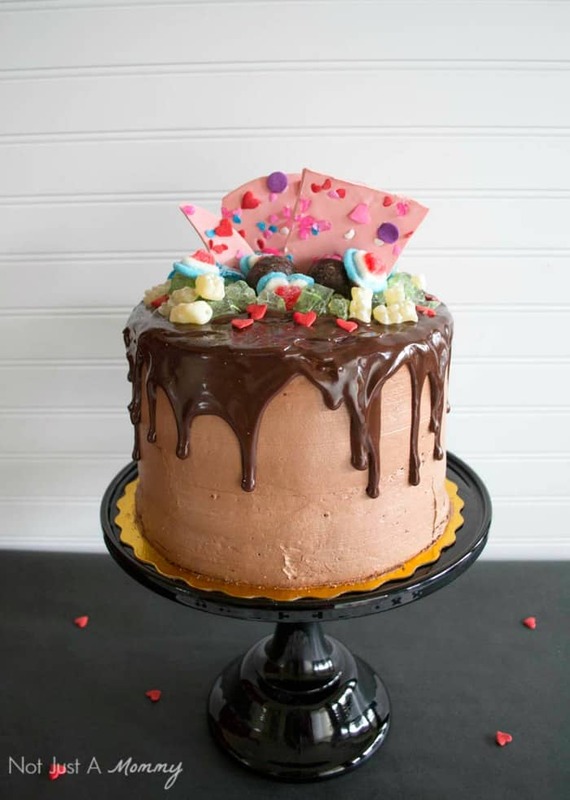 I hope you have been inspired to try something new for Valentine’s Day and make a drip cake! I guarantee it will be a hit and the showstopper of your table. Need more sweet Valentine’s Day inspiration? 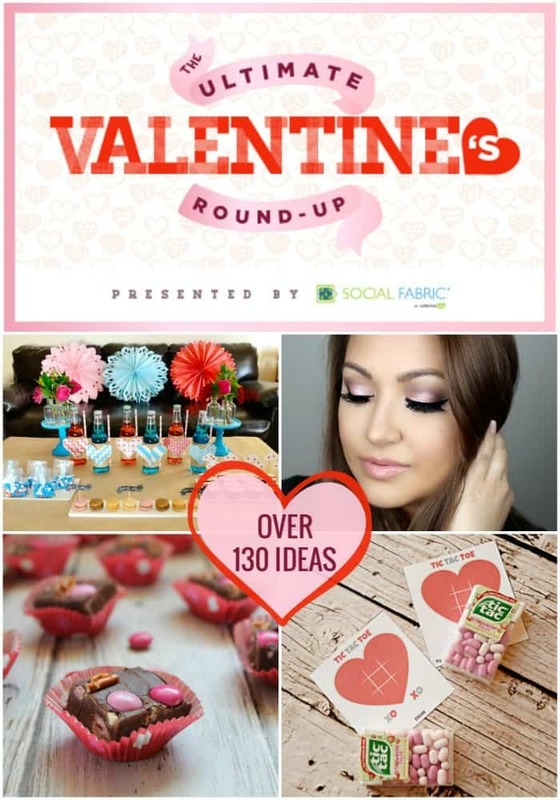 I’ve got lots of ideas on my blog, including a Valentine’s roundup of more than 130 ideas, from recipes and crafts to party ideas and even makeup tips. We’d like to send a big THANK YOU to Dawn of Not Just A Mommy for sharing this gorgeous cake tutorial with us. Over on Dawn’s blog you’ll find plenty of party ideas for all of life’s celebrations. I hope you’re ready to plan a party because she’s sure to leave you inspired! Be sure to follow her on Facebook, Pinterest and Twitter for even more creative ideas.